The Great Escape Chalets are the latest arrival to the Thong Nai Pan Yai accommodation scene. It is a group of larger bungalows or ‘chalets’ located back from the beach. It opened in late 2014 and offers good mid-range bungalows. It is not so much a resort as a small collection of bungalows. The Great Escape Chalets are located 25 meters from Thong Nai Pan Yai beach between The Four Resort (formerly known as Central Cottage) and Pen’s Bungalows. It is a row of 10 large concrete bungalows that offer, as the official prose claims, ‘garden and mountain’ views. Naturally, previous occupants have already commented on the bad location. This seems unfair – the bungalows are close to the beach; they just lack sea views. This obsession with being beachfront never ceases to puzzle me. Is the extra cost really worth it? Most resorts tend to take up most of their beach frontage with a restaurant, as that can generate more revenue per square meter of sand than through accommodation. There isn’t a restaurant or any other extra facilities at The Great Escape Chalets. No gym or swimming pool or spa. It is an accommodation option that has been created by separately branding a line bungalows that belongs to Pen’s. The bungalows are concrete. Guests enter via glass folding doors. The rooms have tiled floors and windows. They are spacious. They have attached bathrooms with actual baths as well as hot water. The rooms also have small fridges, TVs and free wifi. There is a choice between a room with 2 single beds and a room with a double bed. While prospective guests might get excited about the thought of an actual ‘bath’ in the bathroom, it should be remembered that the water that comes out of the taps is from the nearby waterfall. It is brown water. The colour is not noticeable when having a shower, but will no doubt be spotted in a white bath. Moreover, every summer sees water shortages in Thong Nai Pan. The use of baths hardly helps the effort to manage limited water supplies. 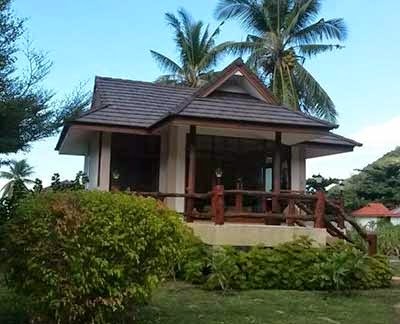 The ‘Superior Chalets’ cost about 1,500 Thai Baht a night. While they are more spacious than most of the bungalows in Yai they aren’t beach front and are more than twice the price to bungalows at The Four Resort, Dolphin Bungalows, Nice Beach Resort and Longtail Beach Resort. Those brave enough in this age of internet booking to just turn up might well be able to get a discount as ‘walk in’ trade. In which case head for Flip Flop Bar on the beach and enquire in there.